In search of a fresh start and new experiences, alumni Sean Leggett found exactly what he was looking for at Castleton. 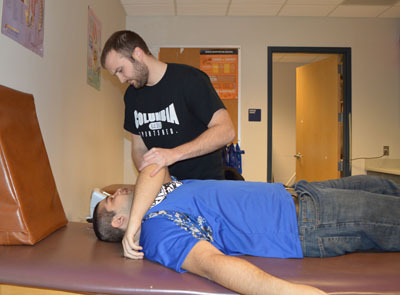 “After an introductory course to Athletic Training with Professor John Feenick and lab with Professor Michael Heitkamp, I knew I found what I wanted to do the rest of my life,” Leggett said. Castleton had both the Athletic Training program that he desired and allowed him the flexibility to be a member of the men’s soccer team. What appealed most to Leggett about the unique program was that student athletic trainers were able to get valuable field experience while working alongside Castleton’s certified trainers. Since graduation, Leggett still remains in close contact with many of his professors, clinical instructors and friends who all played a large role in his success at Castleton. He plans to attend graduate school in the near future, and is currently working at Columbia High School, East Greenbush Central School District in East Greenbush, New York. “I'm proud to be part of a school that has produced so much success,” Leggett said.